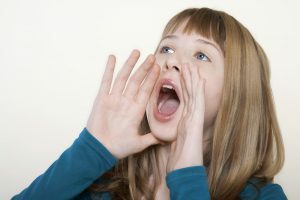 When was the last time you had to shout for someone? Did you cup your hands around your mouth? We all do it, but why? 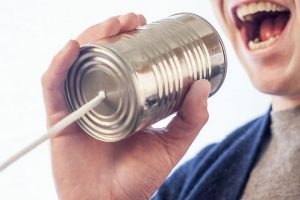 You can help your child explore the effects of different materials on sound amplification with these simple but fun activities. The Masai folk story, Who’s In Rabbit’s House, is a great introduction to this activity, because you can start with a discussion of how the Long One used a rolled-up leaf to make his voice sound louder. To begin, ask your child to call out as if to someone in another room. If she cups her hands naturally when she shouts, ask her why. If she doesn’t, ask her to try it and see if it makes her voice sound louder. Ask if she knows why. Explain that our vocal chords are little strings in our throats. They’re attached to the larynx (what some people call a voice box). When we speak, air makes the strings vibrate, which creates sound waves. Those waves come out through our mouths and go into the air, spreading out in all directions. When these waves strike someone’s ear, they strike three tiny little bones in each ear that can pick up vibrations, and that person can hear the sound we made. The more the bones in the ears vibrate, the louder the sound. Because of the way the waves spread out, the energy of the sound waves is also spread out, so by the time they reach a person standing at a distance, many of the waves have dissipated. The farther away the person is, the fewer sound waves will reach them, and the less the bones in his or her ears will vibrate. When we cup our hands around our mouths, the sound waves spread out less. Because our hands force the waves to move in the same direction, their density does not decrease as much. That means the sound can travel farther, and a person standing at a distance will be able to hear us better. Cupping your hands around your mouth makes your voice reach farther and sound louder. In short, you’ve turned your cupped hands into a megaphone. 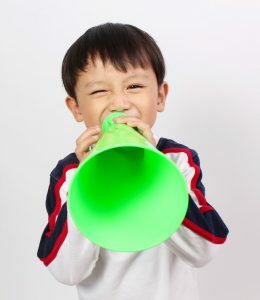 A megaphone is a cone-shaped device used to amplify a person’s voice. You and your child can make one from a Bristol board or poster board. A piece of construction paper will also work, but it won’t be very sturdy. The larger the board, the larger the megaphone will be. Let your child decorate the board with markers, construction paper shapes, glitter, or paint. Alternatively, he may choose to wait and decorate the completed megaphone by covering it with colored duct tape. Tape the cone closed using strong tape. You may want to trim the excess from the “bell” of the megaphone to make it even. 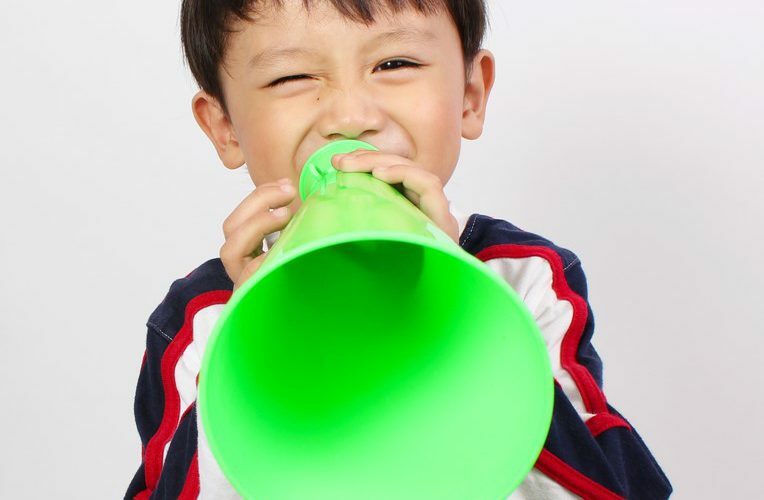 If your child did not decorate the megaphone before, he can do so now, covering it with decorative duct tape to make it stronger and more durable. A “telephone” made of two cans connected by a string. One end of each can is open. The other has a small hole through which the string is attached. Guide your child through an exploration of the various materials. Take turns talking into the various tubes, cans, and funnels. Why is a megaphone louder than a toilet paper tube? Does it matter if the tube is longer or shorter? If it’s wider or thinner? If it’s made of cardboard, metal, or wood? Experiment with the “tin can telephone.” Does the thickness or length of the string change the sound? How about the size of the cans? Now have your child hold the balloon up to her ear and tap softly on one side. Even though it’s a gentle tap, it will sound loud. Why? 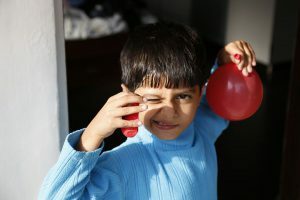 The balloon amplifies the soft tap because, when you blow up a balloon, it is always trying to snap back to its original size. That means it’s always pushing on the air inside it, squeezing the molecules closer together. The closer together the air molecules are, the better they conduct the sounds waves.